Add the milk to the bread crumbs, let soak for a few minutes and then, using your hands, squeeze dry. Place the crumbs in a bowl and add the deconstructed(taken from skins) sausage and half the parmesan cheese. Mix with your hands and season to taste. Add a little olive oil into your non-stick frying pan, garlic cloves and sprig of rosemary, now add the pork mixture and gently fry, don’t overcook. 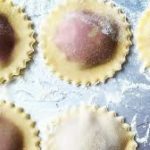 Remove rosemary and garlic, let cool and start filling your pasta squares and make Tortellini or Ravioli either shapes work well. Melt the butter with the sage leaves in a small frying pan until the butter is very hot and your sage leaves are crisp, don’t burn. Sprinkle the bottom of a flat dish with 2 tbs parmesan cheese. 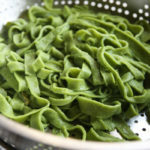 Lift out the pasta with a slotted spoon and place in the dish. 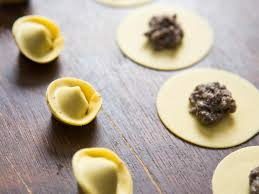 Dress with the hot melted butter and the crisp sage, then sprinkle with the rest of the parmesan.